If you’re missing one or more teeth, or have grown frustrated with traditional dentures, you may be asking yourself this very question. Perhaps you’ve heard about the many great benefits of dental implants, and you’d like to take advantage of them. If so, don’t hesitate to get in touch with Dr. Salivonchik’s Whitehall dental office. Dental implants are a great restorative dentistry option but they aren’t right for every patient. If they are right for you, though, Dr. Salivonchik can help. With our on-site periodontist and talented team, we can place and restore your dental implants right from our office. What Makes Dental Implants Superior To Other Restorative Options? The key difference between dental implants and another restorative dentistry option like traditional dentures, or a traditional crown and bridge is that dental implants replace both your missing tooth and your missing root. Without your root, your jaw will atrophy, eventually causing further tooth loss. With a restored root, though, you can look forward to enjoy a strong, functional, natural bite once again. 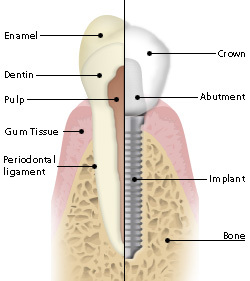 Want to learn more about how dental implants can help you transform your smile? Visit the dental implants page on our website, and call us if you have any questions or would like to set up an appointment. Dr. Salivonchik’s Whitehall office is located in Lehigh Valley and serves patients from Allentown, Bethlehem, Easton, The Poconos, and surrounding areas. Comments Off on Do I Need Dental Implants?